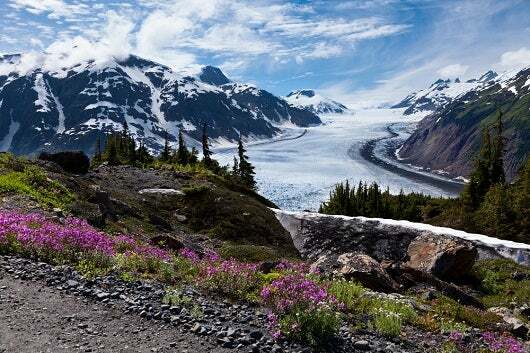 Alaska is a fantastic destination for sightseeing and outdoor recreation, but it’s a long flight from what Alaskans call “the lower 48,” and it’s truly vast. At twice the size of Texas, Alaska is by far our largest state. It’s also an interesting award travel destination, since some airlines include Alaska as part of the continental United States, while others create a separate zone like they often do for Hawaii. 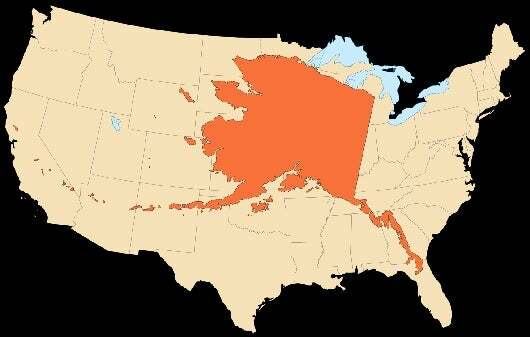 The size of Alaska compared to the continental United States. Several airlines offer service to Anchorage, and some have seasonal service to Fairbanks and Juneau. For all other destinations, award travelers will have to rely on Alaska Airlines, which offers extensive service throughout the 49th state. Thankfully, Alaska is a Starwood transfer partner, and flights on Alaska can also be ticketed with miles redeemed from other frequent flier programs including LAN, Delta SkyMiles, Emirates Skywards, Cathay Pacific Asia Miles (economy class only), Air France/KLM Flying Blue, American AAdvantage, and British Airways Avios. Therefore, using miles from Alaska or one of these partners offers major advantages for those traveling to destinations other than Anchorage. When you use Alaska miles, you also have the option of booking intra-state award flights on its partners PenAir and Ravn Alaska (formerly Era Alaska), which operate service to numerous remote airfields. Alaska Airlines stands out as the most attractive airline transfer partner in the Starwood program, due to both its extensive network as well as its reasonably priced awards. Economy class awards are just 25,000 miles round trip, while first class is 50,000 miles, the same price most airlines offer for domestic awards. Alaska also offers intra-state awards for 15,000 miles in economy and 30,000 miles in first class. Finally, the British Airways Avios program is distance based, and award flights within 3,000 miles are 25,000 miles round trip. 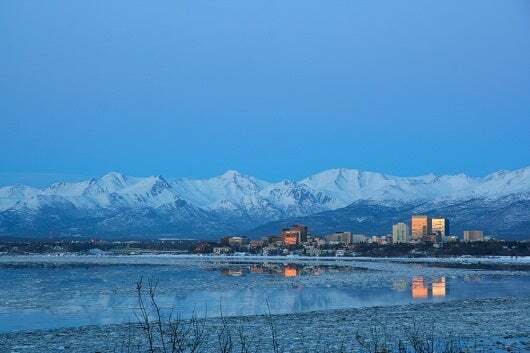 This includes flights to Anchorage from Chicago and points on the west coast. For travel within Alaska, flights on Alaska Airlines under 650 miles can be had for as few as 4500 Avios! Moving up to first class, Alitalia offers award flights from 40,000 miles, followed by Singapore awards on United for 40,000 miles, and Virgin Atlantic awards on Delta at 45,000 miles. United, American, and US Airways all price Alaska awards at 50,000 miles, the same as other destinations within the continental United States. Although there are no three-class aircraft servicing Alaska, these carriers will charge more for service that includes first class on a three-class plane. Those redeeming miles from this program lack the option to transfer points to Alaska, US Airways, and American, but they do have some other unique options. In first class, Alitalia remains supreme at just 40,000 miles round-trip, along with Singapore awards on United for the same price. The only options for flights on American are distance-based awards from BA, Iberia, or the Asia Miles program of Cathay Pacific, which is also a partner with Alaska Airlines. The smaller list of Ultimate Rewards transfer partners makes redeeming Ultimate Rewards points quite a bit more simple. The biggest tip is that you’ll do better redeeming 40,000 miles for a Singapore award for a first class ticket on United than you will if you transfer your points to United MileagePlus, which requires 50,000 miles. If you want to fly Delta, you can redeem your miles with Korean Air, but you’ll have to endure their tedious award ticketing bureaucracy. Instead, choose Virgin Atlantic, which offers Delta awards at 25,000 miles in economy or 45,000 miles in first. Finally, British Airways awards will offer you access to American and Alaska flight awards as described above. Now that Citi ThankYou Points can be transferred to 8 airline partners, the ThankYou program is now part of the conversation. Like Ultimate Rewards, the list is small, so options are relatively easy to parse. Cathay Pacific Asia Miles. This is one of the best options among ThankYou points transfer partners as it is the only one that allows awards to be ticketed on Alaska Airlines. This is especially important if your destination is not Anchorage. Unfortunately, its distance based award chart is not very generous for longer journeys, and can require more than 25,000 miles if your trip begins outside of the Pacific Northwest. However, award flights under 600 miles in distance require only 10,000 miles, so this is a great option for intra-state trips. EVA Air. This Star Alliance partner does not have an especially attractive partner award chart. It includes Alaska for awards within North America, but requires more miles than fellow Star Alliance transfer partner Singapore. Etihad. This Persian Gulf carrier is a OneWorld partner, but it doesn’t publish an award chart. Furthermore, reports indicate extreme difficulty booking flights on American Airlines with Etihad Guest miles, so their miles would seem to be an unlikely way to get to Alaska. Garuda Indonesia. While Garuda is a SkyTeam partner, it might be one of the most difficult airlines in the world to book an award ticket with, as our recent overview shows. Malaysia Airlines. In light of the two recent tragedies that this carrier suffered, its future remains in doubt. Notwithstanding, this OneWorld carrier offers a distance based award chart that is less generous than fellow OneWorld carrier Cathay Pacific, so it would be an inferior option in most cases. Qatar Airways. This American Airlines partner offers terrible value in its distance based award chart, especially when traveling as far as Alaska. You only option would be the seasonal service to Anchorage from Dallas on American, and that would cost 75,000 miles round-trip in coach! Singapore Airlines. As with other transfer programs, Singapore is the best value with 25,000 mile awards in coach, and 40,000 in first. You can’t beat that! Thai Airways. This Star Alliance carrier recently announced, and then indefinitely postponed a drastic devaluation of their miles. Apart from the uncertainty, redemption rates on Thai Airways are higher than other ThankYou Rewards partners, so it’s hard to find any good reason to transfer miles to them other than to top out a substantial existing balance in order to ticket an award.